While posing with a gun during an interview, the leader of an armed pro-government group said the ruling Justice and Development Party (AKP) government supports its followers owning guns, especially after a failed coup in July 2016. 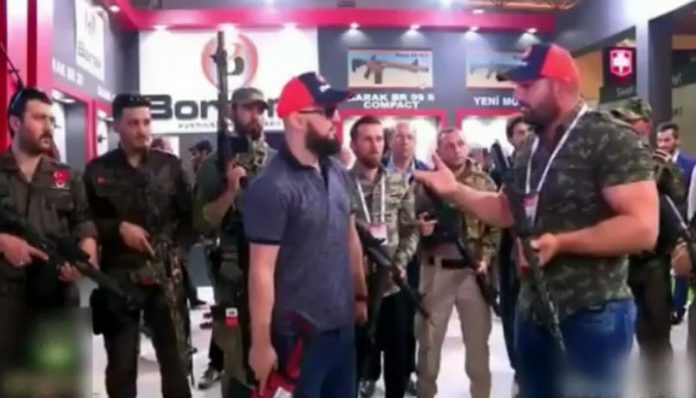 In a video recording of an interview by Ahsen TV reporter Bülent Yapraklıoğlu, known for his staunch support for President Recep Tayyip Erdoğan and the AKP government, Yapraklıoğlu and a group of people are seen holding guns, apparently at a gun show. During the interview a person who appears to be the leader of the armed group in camouflage said they have been training with guns at firing ranges with permission from the police and gendarmerie. Underlining that the government supports people being armed after the failed coup on July 15, the person says they are getting ready to defend the government in a possible uprising or military coup. According to reports in the Turkish media, AKP officials encourage its supporters to arm themselves, and they recruited new military and police personnel from the devoted AKP grassroots following the coup attempt. According to new regulations based on state of emergency decree No: 678 issued on Nov. 22, 2016 by the AKP government, retired officers and non-commissioned officers are to be given the responsibilities of recruitment until Dec. 31, 2020. SADAT was established by 23 retired officers and non-commissioned officers under the leadership of retired Brig. Gen. Adnan Tanrıverdi, who was recently appointed as an adviser to President Erdoğan, on Feb. 28, 2012. According to a video released on the Cumhuriyet daily website in February, Orhan Uzuner, the father-in-law of Erdoğan’s son Bilal, has also established an armed group to mobilize the public in the event of a new coup attempt. “Our smallest device is a whistle. There is a megaphone in my car. There are also guns that we will use when necessary. We need to make such preparations,” Uzuner said, adding that they were united around Erdoğan.